I had come back for my second visit to the Trinity Alps less than three weeks after my first one in February. 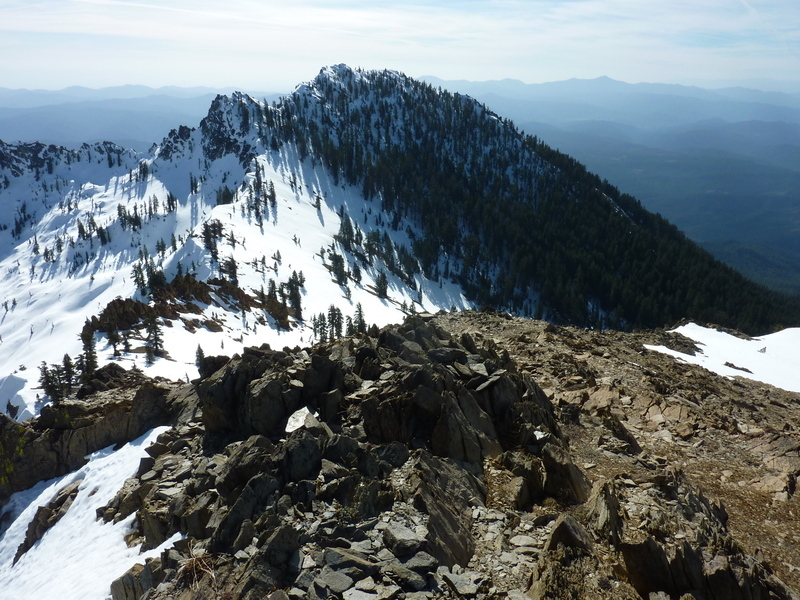 On that trip I had only touched the corner of the Trinity Alps Wilderness with a climb of Weaver Bally and Monument Peak, but at around 7,000ft, these summits did not hold significant snow in a drought year. That distinction was held by the higher summits of the Red and White Trinities to the north and northwest, respectively, and this trip was designed to get me higher into this spectacular area, often described as the Sierra in miniature. The Red Trinities make up the eastern section of the Trinity Alps, drained by Coffee Creek to the north, the Stuart Fork of the Trinity River to the west and south, and Clair Engle Lake to the east. They contain a number of CC-listed summits and P900s which I had mapped out for 2-3 days worth of adventure. Today's hike would be along the Granite Peak Trail, one of the few maintained trails leading to a summit in the Trinity Alps. It seemed a good starting point for a more intimate look at the range. I followed the driving directions in Mike White's Trinity Alps & Vicinity which got me to within a half mile of the Granite Peak TH. The last section of road was steep and rutted and I was not willing to take a chance on it with my van at night (it didn't look much better in the daytime, either). I backed down to a flat spot to spend the night after a long drive of some seven hours. I was up and on my way shortly after 7a. I was equipped with my standard snow travel kit - snowshoes, poles, crampons & axe. It was almost 7:30a by the time I reached the TH, marking the beginning of a very long uphill climb. The trail climbs 4,500ft in a little more than 4mi on its way to Granite Peak's summit, a long grind by most measures. Initially the trail stays buried in forest with only fleeting views, and those are mostly to the southeast in the direction of Trinity Lake (or more formally, Clair Engle Lake). There was some early season downfall along the trail, but nothing that couldn't be easily surmounted. After a few miles the Trinity Alps Wilderness boundary is reached. More climbing through more forest ensues. The trail meanders through a section of more open hillside meadow where a branch of Stoney Creek drains down the middle. Many switchbacks follow. A view opens up briefly to the south and Monument Peak which I had visited a few weeks earlier. It is soon lost again. By 9:30a I had reached the only trail junction on the way to Granite Peak. The left branch traverses around the southwest side of Granite on its way to Red Mtn Meadows and a junction with the Stoney Ridge Trail. The right branch continues up to Granite Peak and it was in this direction I dutifully headed. This also marks the juncture of the more fun part of the outing. Most of the elevation work is done (though still plenty to do), the views open up more broadly and snow begins to cover the ground more thoroughly above 7,500ft. I'm not sure if I could have managed to reach the summit in just my boots as I found the snow still hard and somewhat steep. Luckily I was prepared and it was not far below the summit that I donned my snowshoes. Ten minutes later I was at the top, or at least what the end of the trail would like you to believe. The south summit was once the site of a USFS lookout, but only some concrete pads remain. There are two large ammo boxes containing the collective notes and pages from so to a popular summit. None of it seemed to date back very far and it mostly looked like the contents of a wastepaper basket. I really dislike the sight of such things and had the urge clean them out except the one small notebook, but I fought the urge and simply left it all as I found it without bothering to sign anything - there seemed little point. To the north is the obviously higher summit and it was to this I headed to complete the trek. It took less than five minutes to make the crossing along the snow-lined ridge to the highpoint. It seems a better place for a register to be located but I suspect the trail does not continue under the snow. The views are grand from either location. To the east and south they stretch out for many hazy miles, taking in Mt. Shasta, Mt. Lassen and hundreds of square miles of forested lands reaching to the Sacramento Valley. To the west are the higher Trinity Alps (the White Trinities) with Thompson Peak standing tallest. Nearer in is Red Mtn which I planned to visit. To the northwest was Middle Peak (next on my agenda) and to the north, Gibson Peak which I planned to do the following day. The traverse from Granite to Middle was an interesting one. I'm not sure if the snow made it easier or harder. The ridge itself was too rocky to follow so I traversed down the west-facing slopes over steep, hard snow. It got steep enough that I judged the crampons to be a safer bet than the snowshoes I had used up to this point. It wasn't steep enough to swap the axe for poles and I found the crampon/pole combination good for the majority of the snow travel. Once down to the saddle with Middle Peak the route becomes far easier. The snow is softer with more sun exposure, but not so soft as to sink in any appreciable amount. There was a mix of snow and rock on this sunny face and it seemed one could choose to favor one or the other. I chose the snow until I was near the summit and could climb the last section without needing the crampons. It was close to 11a when I reached Middle Peak. Far from any trail, I was in a wintry landscape with snow around me in all directions, but it felt more like spring than winter. There were peaks and valleys in all directions begging to be explored - what a fine sight it was! I had entertained the idea of making the almost 2mi trek north to Gibson Peak but that was more of a map-perusal fantasy best conducted in the comforts of home. The reality was that it would be a far more arduous undertaking now that I was looking at it from Middle Peak. It took only a moment to redirect my attention southwestwards towards Red Mtn. The distance is only half that to Gibson and the mile of terrain is more benign, though still interesting. I had to remove the crampons in several places on the descent from Middle Peak where the snow could not be connected in a continuous fashion, with some easy class 2-3 rock to negotiate. On my way down to Stonewall Pass one of the connector bars on my crampon broke in two, rendering it unusable. Luckily I still had the snowshoes (which I switched to) and another pair of crampons back in the van (for the next day). I had had this pair of Grivel G-10s for more than ten years without a problem so I was a little forgiving. Later, I was less so when I found this was not so uncommon. In fact, Grivel now pushes a flexible connector bar as a replacement since the stiffer version can create undue stress when used with flexible boots. $20 or so got my crampons back in working order, though Grivel never responded to my request for help directly - their lifetime warranty appears meaningless. I reached Stonewall Pass just after 11:30a and spent the next 45min scrambling to the top of Red Mtn. It was about half on snow, half rock scrambling, some of it very nice on a mildly exposed ridgeline. The views from the top of Red Mtn are much like on the other peaks I'd visited, perhaps with a better view south towards Monument Peak and a nicer view into the Stuart Fork drainage to the west. An ammo box here held a register with more than 40 pages filled since it was placed in 1999, suggesting it is fairly popular, but by no means to the degree that Granite Peak is. In descending Red Mtn, I decided against returning to Stonewall Pass as planned for a somewhat more direct route down to Red Mountain Meadows. Snow covered only a portion of the meadows but the grass was all brown from the previous season - it was not yet ready for spring at this elevation, but would probably arrive in the next few weeks. I picked up the Granite Peak Cutoff Trail and followed it partway back up towards Granite Peak. Where the trail turns NE to climb the last 300ft or so to the junction I simply left the trail and headed cross-country down the drainage to pick up the Granite Peak Trail about 800ft lower. It would take until after 3p before I returned to the TH and the van. Having more than a few hours of daylight remaining, I headed back down to Clair Engle Lake to tackle a few easy prominence summits. Separated by about 3mi, the two are located in the Whiskeytown-Shasta-Trinity NRA, east of SR3 and west of the lake. I drove back down to the pavement at SR3 and then north to Covington Mill before turning right on a side road that follows through a residential area above the lake shore. First up was the higher of the two, Bowerman Peak. Named for an early pioneer family, there are numerous placenames throughout the area that have been given the Bowerman name including a ridge, gulch, peak, meadow and more. The 1878 Bowerman barn has been nicely preserved along this route at a picturesque turn in the road adjacent to a grassy pasture. I found the dirt/gravel road I had intended to drive partway to the summit was gated for the season at the pavement. I was around 3.5mi from the summit at this point, so it would have to do. I was happy to have my bike with me and made good use of it on this outing. The road I followed for most of an hour was of a decent gradient, not so steep that I had to walk the bike, but steep enough that hiking would have taken almost as much time. The big advantage of course would come on the return downhill. The main USFS road I followed does not go to the summit, but skirts around the west side to continue north along Bowerman Ridge. Not shown on the topo map, a side road from the south can be used to reach the antenna-topped summit. I recall passing by it on the bike and suspecting its purpose, but continued with the original plan which was to park the bike at the highpoint of the road on the peak's west side and then cross-country for the last 1/3mi. I left the bike parked on the side of the road without bothering to lock it, figuring the chances of someone coming by were slim, and even slimmer than someone would come by and steal the bike for the short time I would be gone. The cross-country was through forest understory and not brushy aided by the existence of an old firebreak or logging road. I came upon the summit road just south of the highpoint where I first noted the microwave relay tower that is planted at the summit. The views are poor, but with a little effort one can drop just off the west side to get a view to the Trinity Alps, though mostly washed out this late in the afternoon. The bike made the return a breeze, taking all of twenty minutes, including the cross-country portion.